I hope that metal is being saved for recycling! 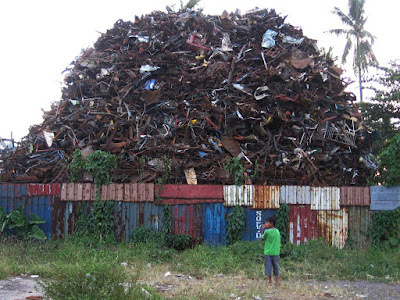 What a tall heap! Vernz, thanks for visiting my blog. Yes, it's a painted mural in the background, on the wall of the restaurant. Hey Vernz, thank you for visiting my blog. Boy that is some heap of scrap that you pass by. You probably turn your head the other way so you don't have to always look at it. I do hope that us humans will have time to find solutions to all these piling problems before it gets out of hand. Actually, Vernz, that picture with the colorful fence in front, is a work of art. I know it must be an eyesore, but the way you took the photo makes it kind of cool looking. A puzzle that might take a while to be solved. Very impressive photography, especially with the front and background of it. A deep bow and the wish for a wonderful Wednesday for you all. Wow. I hope they recycle it soon before all that metal falls on someone! Wow what a heap. It obviously all needs to be recycled and very soon.